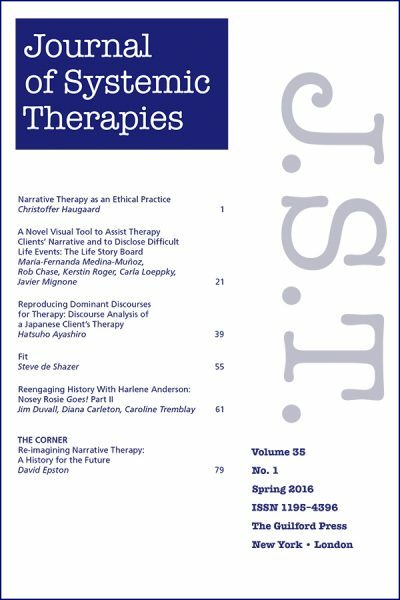 In March 1981, the first issue of Journal of Strategic and Systemic Therapies was released. It immediately found its niche in the flourishing world of family therapy and has continued to evolve. Over time the name was changed to Journal of Systemic Therapies (JST). Since that time many pioneers and practitioners in the field have published breakthrough ideas and practices in JST. The journal currently publishes works that are embedded in a systemic or postmodern, poststructuralist, social constructionist theoretical orientation. We are interested in supporting non-normative, non-pathologizing ways of working with people. These are collaborative ways of working that emphasize people’s local knowledge and abilities, their commitments and preferences. JST presents ideas that are provocative and practices that work with families, individuals and groups. Journal of Systemic Therapies explores the latest concepts in such areas as brief therapies, solution-focused brief therapy, relational approaches, collaborative dialogical therapy and narrative therapy. This journal is a solid teaching tool – reader friendly – with a major focus on practices. NOTICE! By using the promo code NEWS, as a new subscriber you will get a 20% discount off a subscription.